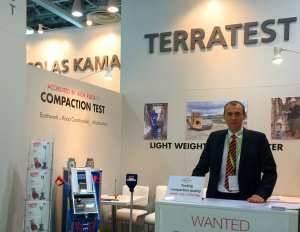 TERRATEST’s Light Weight Deflectometer is now already for the third time at “bc-Bauma India 2014”, India’s largest construction trade fair. From 15 to 18/12/2014 TERRATEST presents itself with its own booth in the German Pavillion in Hall 3. “TERRATEST 5000 BLU” is the first Light Weight Deflectometer with Bluetooth technology and Android app. “Today, at the first day of the trade fair, we have already had very promising conversations with road construction authorities and civil engineering companies,” says Frank G. Schulz, CEO of the TERRATEST GmbH. “Our potential clients are deeply impressed by the Bluetooth technology of our Light Weight Deflectometer. The possibility to control TERRATEST’s Light Weight Deflectometer with an Android smartphone or a tablet is also met with great interest. We expect the Indian market to hold promising growth rates for our Light Weight Deflectometer in the near future,” adds Schulz. TERRATEST has delivered a variety of Light Weight Deflectometers to road construction and civil engineering companies as well as universities in India within the last years.